The new carnival is coming! Be confused about the new events? Don't worry, come with me to step on an exciting journey! 1.Exchange your Peach Blossom for new keys and resources on the FIRST and SECOND DAY of the carnival! 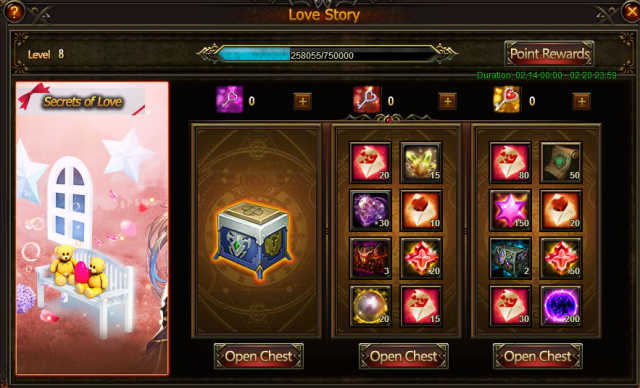 2.You can get Love Card and Love Album (the new tokens) in Elemental Zone instead of Gemology. 3.There will be Time-limited resources on sale from Feb. 17 to Feb 20(server time)! 4.New hero Bounty Hunter and sylph Ocarina, plus new mount Black Panther will also show up there. Wanna dress up a new clothing? City Hunter Costume and Elven Camouflage can be your choice! 5.Time to decorate your Homestead with more Valentine themed components. White Rose, Yellow Rose, Teddy Bear and Sping Fragrance are waiting for you! 6. Source of All Souls, which are used to upgrade your Amulets will also be available there! 7.Take the cute and enthuasiastic Rabid Claw with you! This is icon. Ready? 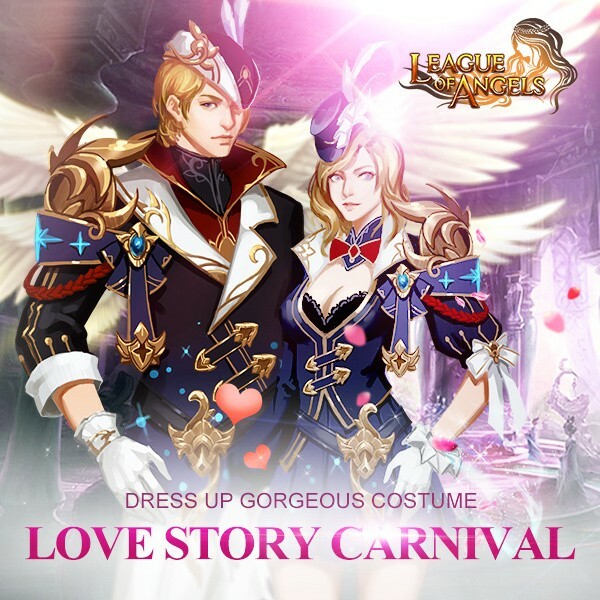 Click - Let's enjoy the Love Story Carnival! Click the icon of Christmas Holiday, and you will see four parts. They are Heart-warming Moment, Keep You Company, Secrets of Love and Forever Joy. Fight together and get great rewards here! Click Heart-warming Moment you will see this panel. 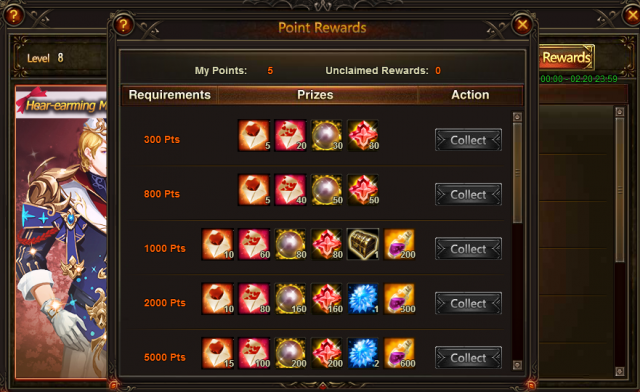 When the EXP reaches certain amount, all players in this server can collect the rewards. 1. Every Love Card acquired will earn a player 1 personal point and increase the Heart-warming Moment EXP by 1. Every Love Album acquired will earn a player 2 personal points and increase the Heart-warming Moment EXP by 2. 2. All New Force's level rewards can be collected once daily when available. 3. Join the Keep You Company event during the event for a chance to receive Love Card. Resources, Love Card, Love Album (the tokens) and more are waiting for you in Gift Boxes! You can randomly get one of the following items with different kind of Corns. Good luck! There are 3 kinds of gift boxes. You need to collect stockings to open them. 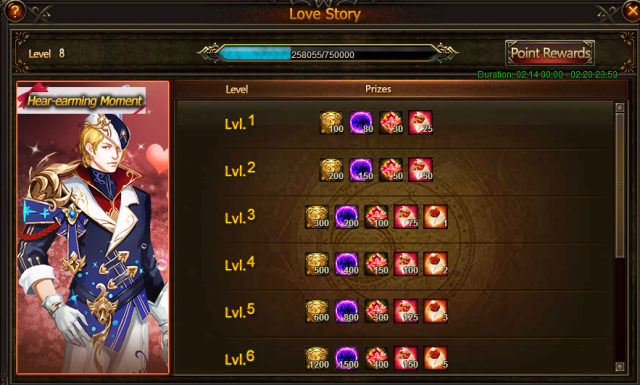 You can get Icon Love-key, Silver Love-key and Golden Love-key through Hot Events or use diamonds to buy. You may ask, how to deal with the Love Cards and Love Albums I have got? OK, here comes a chance for you to exchange great items with your tokens! In Forever Joy, Parchment Chest(Uncommon) and Magic Dust Chest(Uncommon) will be available! New slyph Lannister and Ocarina, plus new hero Inflamed Guard will also show up there. Wanna dress up a new clothing? 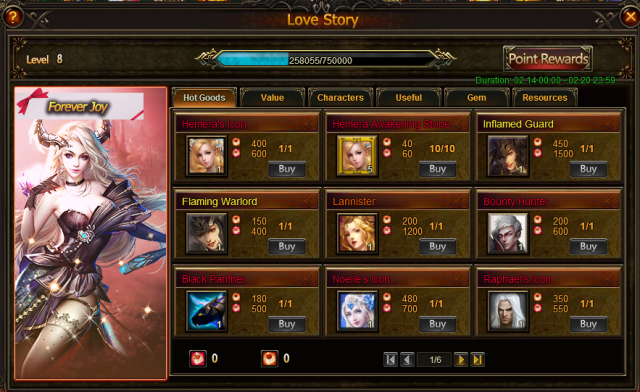 City Hunter Costume, which is the costume on the interface, can probably be yours! And Hemera, Hemera Awakening Stone, Isolde, Isolde Awakening Stone, Darkspirit Ram and Violetspirit Ram will also be there. Purgatory Wand Chest (Epic), Rowan Chest (Epic), Skill Book-Pristine Sprit,Glacial Heart, Stormy Heart, Lvl.10 PATK+CRIT Damage Gem, Lvl.10 MATK+CRIT Damage Gem and more resources will be available! Description: Recharge certain amount（Total recharge) to get special rewards during the carnival! You could win each reward only once during the event. Description: Complete following tasks to collect Lush Peach Blossom! Description: Complete the tasks to get more Love Card here! Enjoy! Description: Reach certain devotion to get more keys for the carnival! Description: Consume certain resources to collect these rewards! Description: Spend certain certain diamonds to great rewards! Don't miss them out! Description: Cheers! Don't forget to exchange your old tokens and keys! You have two days to exchange them this time. Description: Complete all the tasks to collect more resources for your baby! The new Imperial Celebrity can be yours! More exciting events are coming up through Feb 14 to Feb 20 (server time), check them out in the in-game Hot Events now!